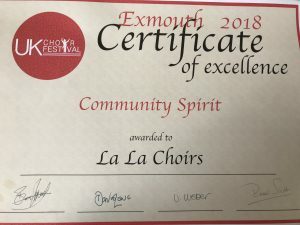 It may be winter in Devon, and summer feels a long time ago, but a large section of La La, the county’s largest non-audition adult choir, still have fond memories of the UK Choir Festival held in Exmouth, back when the weather was warmer. We had a great day, learning new techniques and meeting people from other choirs, just having a good time being together. Community is what La La is all about – we are a large family who have fun singing together! Why not come and give us a try? We’ll give you a warm welcome, and the first two sessions are free. Singing makes you feel good, and being part of a huge, mad, lovely family makes you feel great! See you at Plymouth, Exeter, Exmouth or Ottery St Mary soon ….